Deck the lives of the people closest to your heart with love by sending this Glamorous Parker Metal Vector Pen and Wallet Gift Set that beautifully conveys the message of your heart to them. 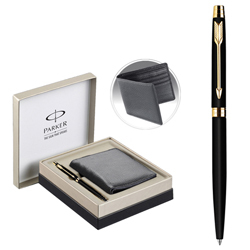 This Parker Vector Ball Pen has a metallic look crafted with Black and Golden colour and is packed with a Leather Wallet Gift Set where the brand Parker is given as a symbol of authentication. This Parker Metal Vector Ball Pen has a trendy look and is meant for easy grip and stress free writing for long hours.